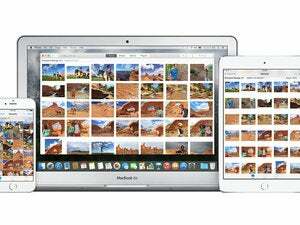 Workarounds for not being able to manually sort photos. Writing Mac 911 columns means never taking a break, even at home, as I’m the in-house tech support for several devices not my own and three other people. My 9-year-old came to me with a quandary after he’d made duplicates of images in Photos in OS X, and then edited them. He wanted to sort the results in a custom order, and was unable. Photos doesn’t allow manually set order in any of its main views, such as the Photos view, All Photos, within moments, and the like. You can create a Smart Album (New > New Smart Album) to grab images that meet criteria, which makes it easy to tag an image with a keyword and have it automatically added to that album. However, Smart Albums can only be sorted (via the View > Sort menu) alphabetically by title, or chronologically starting with the oldest or newest photo. To drag images around without having them snap back into a sorted order, you have to create a regular Album (just New > New Album) and add images to it. Then you drag as you like. Unfortunately, if you’re regularly working with images you want to add to that album, you have to add them by dragging. However, there’s at least a way to automate that. Let assume your regular album is called “Sorted Cat Photos” and that you have a keyword called “edited cats” that you apply to any photos you want in that album. You can regularly go to this Smart Album, select all the images in it, and drag them to “Sorted Cat Photos.” Because they’re now in this regular album, the Smart Album will remove the matches. While this isn’t a totally satisfactory solution, it does automate most of the process.